Available as a coupe or roadster, the 370Z was designed with nimble handling in mind, which certainly shows when you take on tight corners with total precision. Under the hood, the 370Z's iconic engine churns out the power you require for a thrilling performance. Settle in behind the wheel to experience the 370Z's driver-centric cockpit, with its easily accessible controls and infotainment gear. The 2017 Nissan 370Z certainly has a reputation for speed. Under the hood, you'll find a powerful V6 engine that delivers 332 horsepower and 270 pound-feet of torque. However, from behind the wheel, the engine feels much more like a V8. Whether you prefer the traditional experience of the six-speed manual transmission or the smoother seven-speed automatic, the 370Z's excellent response time means swift acceleration. You'll be up to speed before you even know it. When you downshift, the SynchroRev Match technology automatically blips the throttle, resulting in a silky smooth ride. In addition to speed, this stylish sports car supplies driving enthusiasts with the ultra-responsive steering they've been dreaming about. Take on corners - even at high speeds - to experience the 370Z's dead-on accuracy. There's little doubt that the 370Z suspension was tuned for maximum performance, which it delivers in abundance. If you're craving a true racecar experience, check out the iconic Nismo-tuned models, which introduce a range of performance gear that takes your ride to entirely new levels. The upgraded tires, for example, are the perfect racetrack accessories, because they automatically increase speed. The 370Z Nismo also supplies unique aerodynamic body pieces to further reduce drag and improve overall performance. The 2017 Nissan 370Z cabin compliments its sleek, stylish exterior with a graceful, flowing dash and modern comfort features. Handsome leather Recaro sport seats are the perfect on-road companions, because they keep you and your favorite passenger snug and supported throughout your high-speed travels. In roadster models, you can choose heated and ventilated front seats, which are perfect if you live in any kind of extreme climate. If you're cruising with the top down in the middle of August, simply turn on the ventilation feature to cool off in a hurry. This peppy model also treats you to the latest in-cabin technology. For instance, the central 7-inch touchscreen is responsive and easy to use. It offers quick access to the apps you seek. The touchscreen also serves as the navigation display, which supplies handy turn-by-turn directions to keep you from getting lost. When you use voice controls to access infotainment apps, you can alter settings without looking away from traffic. As the name suggests, the 2017 Nissan 370Z Nismo Tech combines high-performance Nismo features with all the latest tech gear. It takes on-road athleticism to the max with a unique sport-tuned suspension. With it, you'll master winding roads with incredible precision. The Nismo Tech's special aerodynamic exterior reduces drag for maximum stability at high speeds. Inside, you'll find tech features designed to keep you connected, including the 7-inch touchscreen interface. The Nismo Tech's navigation system gives you the data you need to explore new territory without a hitch. During spirited rides, you'll feel snug and secure. Stunning speed is always at your command. The 370Z can't help but turn heads with its smooth curves and bold design. Enjoy premium precision and absolute control over your on-road experience. For sports car and speed enthusiasts, the 2017 Nissan 370Z offers solid appeal. 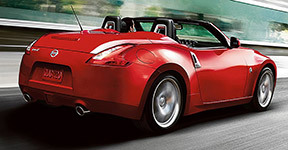 The 370Z churns out stunning power at your behest, going from 0 to 60 mph in just over 5 seconds. 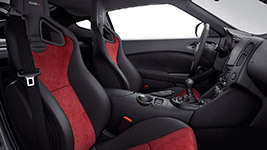 Inside, Recaro sport seats keep you snug and supported, no matter how spirited the ride. High-end tech features, including an innovative infotainment interface, provide an important link to the outside world, thanks to features like hands-free calling.